In my last article, I said I would attempt to nickel plate the three ID plates on my 1951 TD. In this article, I report on my efforts and their results. The plates in question are: a small patent plate, listing various patent numbers applicable to the car; a somewhat larger plate, identifying the Body Type and Number; and an even larger plate bearing the Chassis and Engine numbers. Each plate is brass. (They are listed in the Moss catalogue as Parts No. 408-740, 408-730 and 408-580, respectively. Abington Spares carries them, too.) According to various authorities, these plates were originally nickel plated. In the case of the Body Number and Chassis Number plates, the lettering stamped in them was painted black. The Patent plate has raised lettering with no paint on the raised letters, and the background was painted black. My goal was to restore the brass plates to their original condition. Nickel plating them was not a hard job. Of course, the plates had first to be thoroughly cleaned. I purchased 100 grams of nickel acetate on eBay (about $9.00) and I mixed it with 500 ml of malt vinegar (from a local grocery store for about $3.00) to form an electrolyte solution. I put the solution in a glass jar. I purchased a nickel anode for $5.50 from another online retailer offering scientific supplies to schools. [www.shopminiscience.com; MiniScience, Clifton, NJ, 973-777-3113.] Then I put the anode in the nickel acetate solution. The cathode is the ID plate, and I inserted it into the solution. I connected the anode and cathode to a power supply using alligator clips. 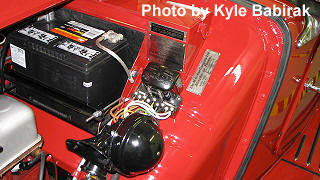 For a power source, I used my 12-volt battery charger, which promised to work faster than a couple of D-size batteries. It took 5 to 7 minutes to plate each piece. I put two coats of nickel on each plate. I had to redo one plate because I inadvertently let the nickel anode slip so far into the solution that the base metal alligator clip, which was attached to the top of the anode, slipped into the solution — thereby contaminating the otherwise pure nickel being transferred to the ID plate. Otherwise, this part of the restoration was easy and went quickly. Caution: The nickel acetate solution is highly toxic. [Ed.note: See www.atsdr.cdc.gov/tfacts15.html]. The hard part was getting the black paint into the stamped lettering. To get started, I sprayed each plate with black paint, my goal being to remove the paint except for what was to remain in the stamped lettering. There are two frequently described techniques to do this: Wipe off the excess paint with a solvent, leaving paint in the stamped lettering, or rub the excess black paint off with rubbing compound. (In the case of the patent plate, the goal was to rub the black paint off the raised lettering, leaving the black paint as the background.) I tried both of these techniques and neither worked for me. The solvent removed too much paint in the recessed lettering, and the rubbing compound would not remove the paint in what I considered a reasonable time. So I “invented” my own techniques. I tried very fine wet sand paper (800, 1000, 1200, and 1500 grits), and this worked better because I retained some control by using progressive grits. But it also removed the nickel plating on the edges of the two thinner plates. I tried using a pencil eraser to remove the paint and this worked better, but it still removed paint from the recesses, and the eraser was hard to control for accuracy. I tried plastic utensils and all sorts of other tools. I spent hours trying to figure out an effective technique. However, just like Edison and the Curies (but without the scientific significance or the Nobel Prize), I finally figured out how to do it after many trials and errors. My right thumbnail and copious amounts of tap water worked best. No other toxic chemicals, no expensive equipment, no advanced chemistry. Just hold a painted ID plate under a running tap and scrape the unwanted paint off with your thumbnail. A thumbnail does not rub off the nickel; it does not even scratch the nickel; you can thumbnail-scrape small areas or large areas; you can accurately vary the pressure; and, most important, it doesn’t remove the paint from the recesses. With this technique, I could remove the paint from one plate in about 30 to 45 minutes. I finished the process with a magnifying glass and a dental probe to clean off very small spots of unwanted paint. I let the paint on each plate dry for a couple of days and then applied a clear-coat to protect them against dulling from oxidation. I also clear-coated the ten small brass bolts and distinctive square nuts used to secure the plates to the firewall. (Don’t get too much clear coat in the slots of the bolts, and don’t get any clear coat on the threads of the bolts or nuts.) I let everything dry for a week before I installed the three plates on my car. This process involves a lot of work, and it’s not something everyone will want to take the time to do. However, it’s a project you can do yourself, and the result is closer to the original finish than a brass plate. Should a couple of Chapter members express an interest, we can get together for a tech session in my garage on some Saturday morning.